I know a quite dubious flag used under Japanese control between 1942 and 1945: red with a white map of the Angkor Wat. No coat of arms is known. The circumstances surrounding the situation of Japanese occupation are somewhat different than in some other of the Japanese occupied territories. The French colonial government in Indochina was under the control of the Vichy government, and at the urging of the German government signed an agreement with Japan giving them movement through the transport hubs of the region. The French were compelled to cede 1/3 of Cambodia to Thailand in March 1941 and Japan stationed a garrison in Cambodia of 8,000 troops. 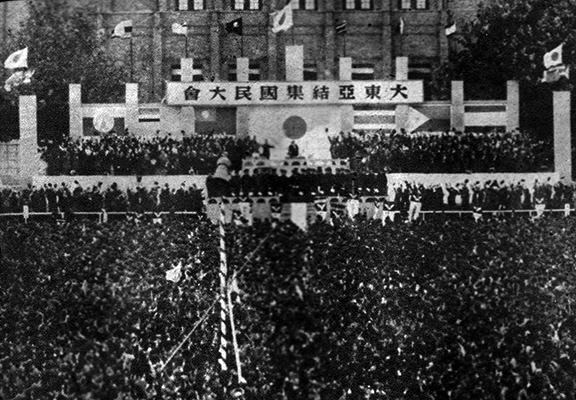 As an occupying force, the events center on March 9, 1945, when the Japanese troops overthrew the French colonial government in hope that the local population would support the promise of independence. Four days later Cambodia declared its independence from France. Plans were put into place to incorporate a 5,000 man local volunteer army to assist the Japanese troops in preserving order, but the war ended before any further plans could be developed. http://blog.goo.ne.jp/sakurasakuya7/e/829a562d94c1c53565624a0d161fd126 shows a postcard from WW2 and it shows the French flag for Cambodia; many of the flags and nations showed here are countries that were under Japanese occupation as part of the "Greater East Asia" to free them from colonial powers. Secondly, at the Greater East Asia Conference in 1943, Cambodia was not represented so their flag was not displayed at the conference (source: http://www.tanken.com/burma14.jpg). Hopefully, we can close in on this mystery. The book you mentioned is scanned from the R.U.P.P. (Royal University of Phnom Penh) "Hun Sen Library" (official website: http://www.rupp.edu.kh/center/library/). 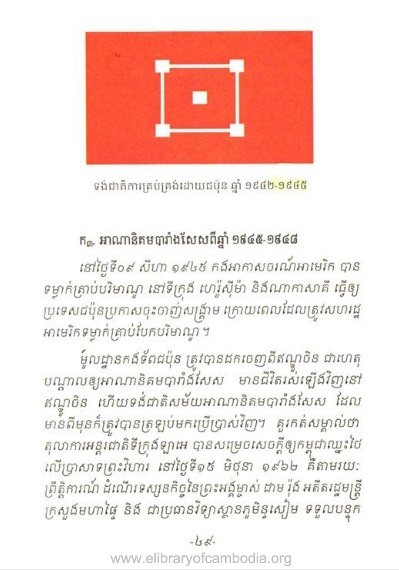 The book is titled "ប្រវត្តិ ទង់ជាតិ ភ្លេងជាតិ នគររាជ" (English: "History of the Cambodian National Flag Nation Anthem Nokoreach" (also spelled Nokor Reach), by Rath Sandab ISBN 978-99963-572-0-6 ("Nokor Reach" (Khmer: បទនគររាជ; Royal Kingdom or Majestic Kingdom, source: https://en.wikipedia.org/wiki/Nokor_Reach). 1942-1945), which is clearly a time when Cambodia was "ក្រោមការត្រួតត្រារបស់ជប៉ុន" (English: under Japanese rule). Image (archived here) is scanned from the above mentioned book, with the date "1942-1945" highlighted in yellow, below the image, with inscription in Khmer and also the description below, also in Khmer). The only fact that needs to be checked is the date of the book (when was it written?) and then it would certainly be a reliable source to verify such "dubious" flag.